A St. Maarten flag now proudly flies atop the highest point of the island’s latest hotel development on the property of the former Dawn Beach hotel destroyed by Hurricane Luis in 1995. The new phoenix, rising from the ashes of that destruction is an ultra-modern five-star complex where luxury will be standard. Construction of the US$120 million, over 400-room Westin St. Maarten Dawn Beach Resort, Spa and Residences is on schedule for a December opening, according to the owner, the Columbia Sussex Corporation’s Vice President of Construction, Tom Donovan, at the celebration to mark the attainment of the highest point of the building recently. The project consists of 310 hotel rooms and 99 three-bedroom residences, which may increase by another 30 similar two-bedroom residences in future. The residences are expected to be completed by Spring 2007, while the hotel proper is on track to be opened by the official start of St. Maarten/St. Martin’s high tourism season in December this year. When it opens, Westin St. Maarten will be the first residence resort property on the island offering the privacy of a home with the modern amenities of a resort. Interest in the residences is reportedly very high, with several reservations already booked. These residences are separate with pool and Jacuzzi, and cater to a wide variety of clients. The new Westin St. Maarten has already shown a significant impact on the island’s economy, and authorities are impressed with the pace of construction but more importantly with the policy of as much as possible making use of the available labor force and St. Maarten sub-contractors. In addition, the resort is already recruiting and training St. Maarteners for positions at the complex when it opens. It is September, 2006. Your aircraft taxis to a stop, after its touchdown. You literally waltz through one of the four jet bridges and arrive at Immigration control, but rather than the customary long lines, you are processed in a jiffy at one of the 10 immigration and passport control points. Welcome to the swank, ultra-modern new terminal building of the Princess Juliana International Airport. Need facilities such as postal services to mail a quick postcard back home, or banking/ATM service for some cash transaction, or is it a fast check of your e-mail on the Internet, all these services and more, including taxi and customer information booths, are available at your fingertips at the brand new terminal building. Indeed, new horizons are no longer just beckoning, they are already in sight. Phase II of the Princess Juliana International Airport NV Master Plan, will be completed in time for it to become operational in September this year, as announced recently by the president of PJIAE, the operating company of the airport, Drs. Eugene Holiday. 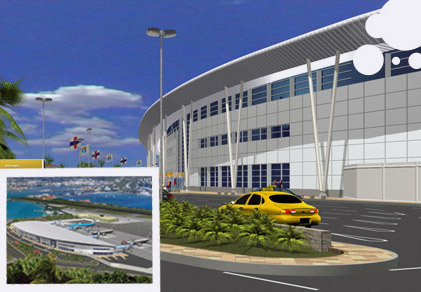 The US$87 million project propels St. Maarten into the modern age of aviation, doubling the size of the current terminal building and increasing the airport’s carrying capacity to 2.5 million passengers per year, way above the 1,646,065 passengers it handled in 2004. And with a 2,815m2 mall offering a large selection of St. Maarten and international brand name stores, passengers will be able to “shop till they board,” especially since 70% of the stores are located after the security check points. The airport expansion project further involved the re-routing of the Airport Road and the construction of additional parking areas for aircraft and motor vehicles. In addition, an integrated Air Traffic Control and Radar Facility—one of the most advanced in the Caribbean—was commissioned in March 2004 as part of the project. Surely, PJIA is not only a hub for the Northeastern Caribbean, it has also become the most strategic asset of the island as a 21st Century tourist destination. Second only to the international airport at San Juan, Puerto Rico, PJIA is committed to enhancing visitor experience and consolidating its position as a regional leader in aviation. The new terminal building is expected to be officially opened by Her Majesty Queen Beatrix of The Netherlands during her planned visit to St. Maarten later in the year. Passengers would have already been making use of the facility ahead of the royal opening.